Hello, everyone! Thanksgiving is next week - already! I know we say it year after year, but the older I get the faster time flies! How is that? I turned 60 in September, and I think it's messing with my mind because I'm starting to feel 60. Not ready for that quite yet! I still have a lot of living to do, God willing! This year, I thought I'd do something a little different. Every handmade Christmas card I sent out last year and years previous said nearly the same thing. 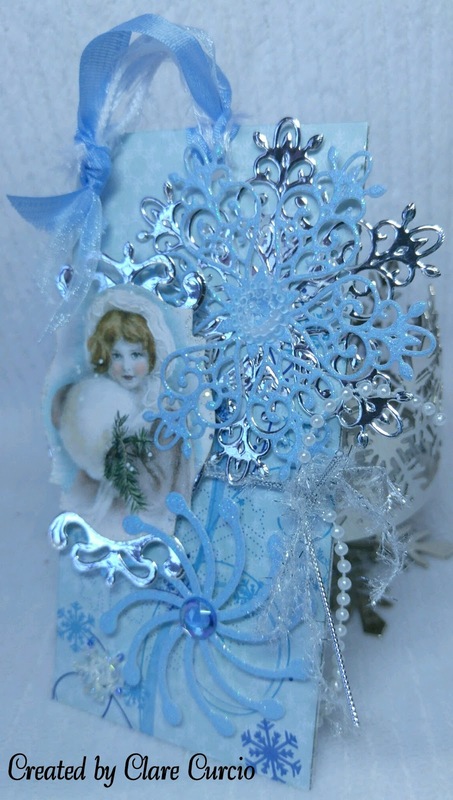 This year, I'm making vintage looking Christmas ornaments that serve as both a card and ornament. Several people have told me that my cards are gifts in themselves, and frameable, so this will make them useful, hopefully for many years to come. I started with some printable, non-copyrighted vintage images from online and a cd I have. They were printed from my computer. 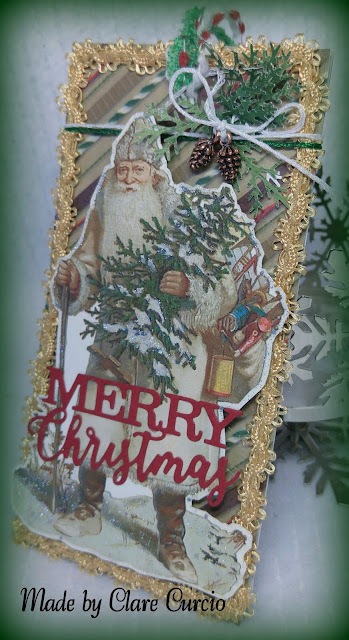 I cut thin chipboard, then covered it with Christmas background paper on both sides. Playing with the images has been fun, and there were so many different kinds of trims, ribbons, buttons, etc. in my stash, that there almost too many to chose from! Glitter, sparkly nail polish, Crystal Effects (SU) all added to the pizzazz! Velvet ribbon, satin ribbon, cording, thin twine and thread were also used. I found some clear plastic mailing boxes online, at a spectacular deal, from a company called Clear Image, Inc. dba Clearbags. They have so many sizes that will hold any size card, and come in different thicknesses to accommodate your 3-dimensional cards! I had seen these, and found them for sale other places, but this company is by far the cheapest, for the most boxes. This first ornament was so fun to make! I love the vintage Santa image. I touched the color up on him using markers, including making his cheeks pink! He is popped up with some dimensional foam tabs. Some sparkly glitter nail polish was added to the snow on the tree and around his feet. Stampin' Up has some little pine cones that were perfect for an embellishment. Several strands of different cord, ribbon and twine were used for the hanging addition. This second ornament includes some snowflake die cuts out of silver and blue sparkle cardstock, a rhinestone center, a beaded snowflake, pearl strand and shiny ribbon to offset this sweet girl. She really looks like me as a child! Thank you so much for visiting! I hope your Thanksgiving is wonderful! I'm thankful for you! Clare, LOVE these vintage projects. They are so beautiful. When I have my free time I always made DIY ornaments as well. This keeps me busy, saves money and create awesome home decors. I find your ornaments interesting and eventually will create one too.